Razer has now launched its gamer-focused smartphone simply called the Razer Phone. The Razer Phone is available in the UK exclusively on the Three network. It is priced at £595 without a contract, or £41 a month with a £49 upfront fee. The device was released following a launch party at Three UK's flagship store in London. Guests were invited to play Super Evil Megacorp's Vainglory on the new smartphone with YouTubers. The free event saw hundreds of interested customers queuing to get their hands on the device. A limited-edition Razer Phone was also on hand to buy. 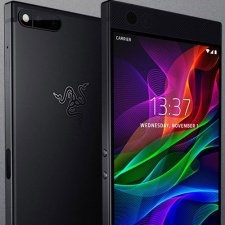 Razer's Phone has been built with gamers in mind, and packs a 120Hz screen, 8GB of RAM, and dual rear 12MP cameras. It is also available in the US for $699. The company signed a deal with Three back in May 2017 to form a global strategic alliance, which explains its exclusivity rights in the UK. The two companies also jointly opened a RazerStore in Hong Kong as part of the deal.